Only Lovers Left Alive DVD Review | Warped Factor - Words in the Key of Geek. Matthew Kresal checks out the recent DVD release of Only Lovers Left Alive. Even before Bram Stoker's seminal novel Dracula was published, the vampire was becoming a staple of the horror genre. Stoker's novel solidified that, even more so in the various stage and film versions that have followed over nearly 120 years. Yet there have also been some fascinating explorations of the notion of vampires outside of the horror genre. One of the most interesting of recent years is Only Lovers Left Alive, a film from writer/director Jim Jarmusch which received a limited theatrical release earlier this year, and is anything but your typical vampire flick. Part of what makes that point clear is the casting. Tom Hiddleston, perhaps best known as Loki in the ever expanding Marvel Cinematic Universe, and Tilda Swinton are the lovers of the title named Adam and Eve. Neither of them fit the typical description of the vampire with Dracula on one side and the bad boy Edward Cullen on the other. Adam and Eve are a quiet, cultured and intelligent pair, who don't spend their nights on the proverbial prowl or stalking teenage girls. Adam has become withdrawn, melancholic and potentially suicidal, sitting in a large and falling apart Victorian house in Detroit composing music with outmoded technology and vintage instruments that no one will ever hear. Eve meanwhile seems much happier living halfway across the world in Tangiers but whom travels to Detroit to be with her lover. Hiddleston brilliantly portrays the melancholic and withdrawn nature of Adam while Swinton seems ever alive and vibrant as Eve. The two of them make a mesmerizing couple both apart and together, becoming the heart of the film in the process. 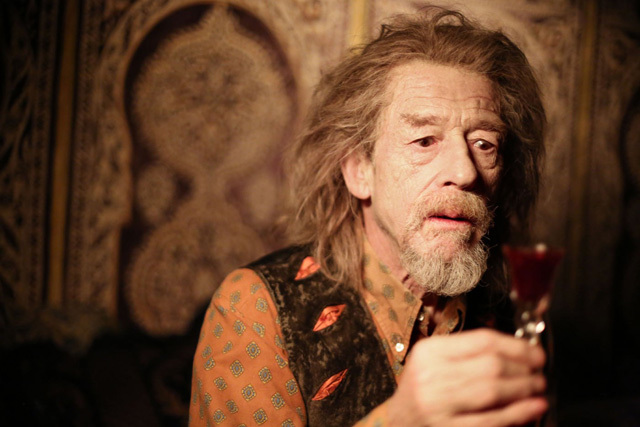 While Hiddleston and Swinton are the heart of the film, they are surrounded by a sparse but effective supporting cast which includes John Hurt as Marlowe, who is magnificent to watch in his few scenes as another aged vampire whose identity will be a delight to more knowledgeable viewers of the film. On the opposite end of the spectrum from Adam, Eve and Marlowe is Ava. Mia Wasikowska plays this charcater exactly like what she is: a spoiled teenager eager for the next high and whose recklessness is both frequent and destructive. Rounding off the supporting cast in human roles are Anton Yelchin as younger rock and roller Ian, Jeffrey Wright as Doctor Watson and Slimane Dazi as Tangiers café owner Bilal. It's in the production values that some of the film's best elements can be found. The cinematography of Yorick Le Saux is outstanding and a visual feast, from the shots that open the film to how it brings to life Jarmusch's characteristic sequences of cities at night. The combination of cinematography and direction bring to life and contrast the largely abandoned post-industrial landscape of Detroit and Tangiers which seems to have one foot in the past and the other in the present. The cinematography also plays up the differences between the two with warm colors pervading through the scenes set in Tangiers while there's a cold and lifeless quality to the scenes in Detroit. Then there's the score, which is an unlikely combination of styles and works including rock band SQÜRL, lute composer Jozef van Wissem and Lebanese vocalist Yasmine Hamdan. This device score brings to musical life the melancholy that lies in the film's soul. Put together, the combination of production values bring the world surrounding the performances to life in a most excellent fashion. Yet this would be all for nothing if it was not for the script from Jarmusch and Marion Bessay. To say that they wrote a vampire film is a disservice both to them and to the film itself. Only Lovers Left Alive merely uses the basics of the vampire myth to work from and the results will likely not be for everyone, especially those expecting either a horror film or a variation on Twilight. Instead the love story here is more mature, more subtle and is reflective of a couple who have been together so long, with one of them experiencing something of a mid-life crisis. 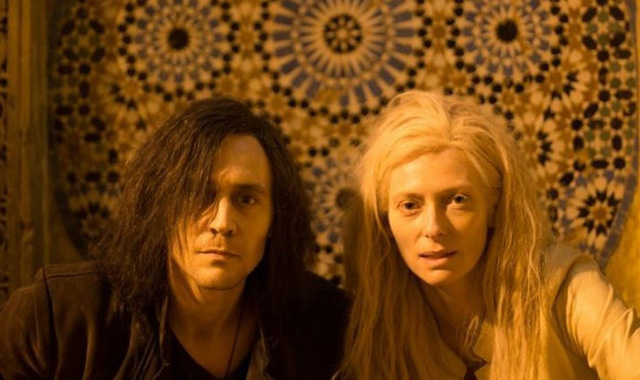 Only Lovers Left Alive portrays vampires as being akin to that of a drug addict, and for all the culture and sophistication that Adam and especially Eve have, they are still driven by baser instincts that could ultimately destroy them. In the end, the script inverts much of the clichés of the vampire film and uses the genre instead to present a meditation on the fine line between our base instincts and what we consider culture. Only Lovers Left Alive has much to recommend it for. From fantastic performances to beautiful cinematography and an atmosphere of melancholy that pervades throughout, it is a work that those who enjoy film will find both thought provoking and gorgeous to behold. I suspect it's something that anyone who is at all creatively bent will recognize something in, for rarely has melancholy been so beautifully and so well presented.